The Econometrics Journal sponsors and publishes the Sargan lecture at the annual conference. This commemorates the fundamental contribution and profound influence on econometrics by (John) Denis Sargan. It promotes econometric theory and methods with substantive direct or potential value in applications and their actual empirical application. In 2019, James Heckman (Chicago) has agreed to give the Sargan lecture. 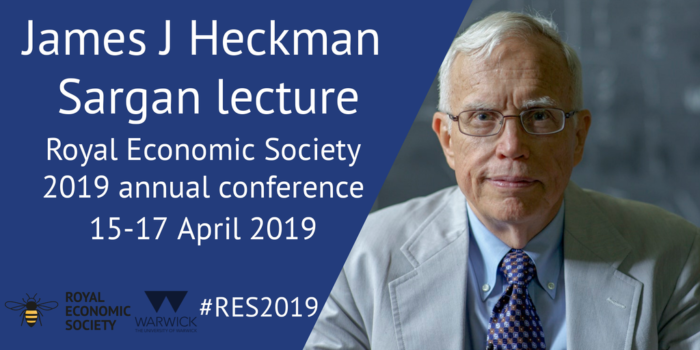 James Heckman has deep knowledge of and affinity with the history of econometrics and has been putting state-of-the-art econometrics at the service of empirical economics for over four decades. He will both speak to the legacy of Denis Sargan and demonstrate the power of econometrics in advancing knowledge. The Denis Sargan Econometrics Prize was introduced in 2011 by The Econometrics Journal on behalf of the Royal Economic Society. The prize is awarded for the best (unsolicited) article published in The Econometrics Journal in a given year by anyone who is within five years of being awarded their doctorate. An honorarium of £1000 is awarded to the winning author.